This Basil Avocado Pasta has been my go to lunch recently. It’s so yummy and creamy. Plus it only takes 15 minutes in total to throw together. I featured this recipe in my What I Eat In Day Video. You can watch below to see exactly how I make it. Filling but not heavy and so satisfying! Bursting with flavour from the basil, lemon and garlic. 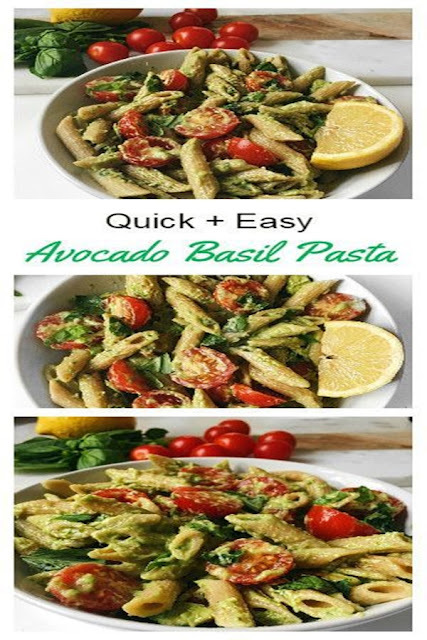 Plus this Basil Avocado pasta sauce recipe is gluten free, dairy free, vegan and full of so much goodness. Avocado – Although high in calories avocados are amazing for you. They aid fat burning, reduce inflammanation and bloating and they are amazing for your skin. Basil– Basil is also a power house of nutrition, full of antioxidants, antibacterial and contains lots of vitamins and minerals such as Vitamin A, C, D, B-12, B-6, Iron, Magnesium and Calcium. Lemon Juice– Rich source of nutrients like Calcium, Potassium, and Vitamin C. It is a great immune booster and promotes healthy, glowing skin. Garlic – Garlic helps to fight and prevent sickness. It contains high levels of Maganese, Vitamin B-6, Vitamin C and Selenium. If your not already, then follow me on Instagram for daily eats, wellness, lifestyle and my travels. In a large pot of boiling water cook pasta and drain well. Place the avocado, garlic, basil, olive oil, lemon juice into a blender or food processor and blend until your desired consistency. Tastes great both chunky or smooth and creamy. Season the sauce with salt, pepper and chilli flakes. I like to serve mine with extra chopped basil leaves and some cherry tomatoes, such an amazing combination.